On Friday, April 19 from 9 a.m. to 4 p.m., both lanes at the south end of South College Drive will be closed to traffic. Steel sheets will be delivered and placed in the median strip to protect landscaping during PW722 construction activities. 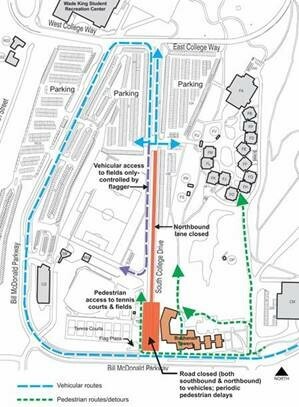 Vehicular access to all south campus parking lots will be maintained by detouring around Bill McDonald. Flaggers will coordinate vehicular access to the fields. Pedestrians will be able to access the university tennis courts and fields through the flag plaza on the west side of South College Drive. Bicyclists will need to use Bill McDonald Parkway or the service road east of Buchanan Towers and Fairhaven as alternate routes to central campus. If you enter campus from Bill McDonald Parkway please account for the road closure in your schedule; the delivery of the steel sheets on Bill McDonald Parkway may also slow traffic. The first phase of the renovation of BT residence rooms, bathrooms and kitchens was completed last year. Phase 2 completes the renovation over Spring and Summer Quarters 2019. Scope includes upgrading plumbing/air supply/ventilation, fire detection/alarm/security systems, hazardous materials abatement, new doors and windows, upgrades to exterior masonry, installation of new gutters and downspouts, and upgrades to interior finishes.